For my final week of travel for this year's spring break was spent in Italy with my friend Nicole! A bit tired from getting back from Scotland, I had an early wakeup call of 4am on Monday to get to Victoria Station by 5:30. Normally, it does not take me that long to get there, but in the wee hours of the morning, it is different. Thankfully, a bus came earlier than expected, so I did not have to wait that much longer in the cold! Nicole and I caught the Gatwick Express to the North Gatwick Terminal. Our flight was somewhat delayed due to technical issues, but we were off to Verona before we knew it. We had booked a bed and breakfast to stay in for the two days we were there. It ended up being less than a minute walk away from Juliet's House and a plaza full of restaurants and gelato places. We quickly dropped our bags, grabbed some sunblock, and hit the square for some food. Of course, since I was in Italy, I ate a lot. If you recall reading my study abroad blog during my fall semester, I named my trip to Rome the "eat" portion of "Eat, Pray, Love." This trip was no different. For my first meal, I had lasagna and some gelato! Refreshed and ready to go, we walked to Juliet's house. It was way too crowded to go into the museum, so we agreed to go back the next day. We did snap a few quick photos! We hopped onto the Hop On, Hop Off bus route B to see the rest of the city. We took the whole trip around once before we decided to get off and view the Verona Arena. Yet, before we got through the entire first trip around, there was a mini pit stop at the top of a hill overlooking the city. I know I had wanted to make my way up there either by foot or cab, but this was even better! We explored the Verona arena which was similar to the Nimes Amphitheater. We were not used to having the sun and warm temperatures (no offense, London), so we sat and people watched for quite some time that afternoon. Actually, for the whole trip, we did a lot of people watching. Taking a break before dinner, we ended up walking around several different plazas before settling on a place to eat. We even came across the plaza named for Dante. 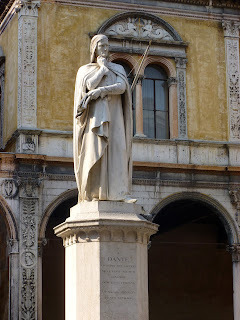 Dante, as we learned, lived in Verona for part of his lifetime. This was our view for dinner that evening as I continued my pasta eating quest! It was a great first day, but with our early morning, we called it an early night! Stay tuned for the rest of the Italy posts! Ciao! Don’t miss the chance to go to Italy, go to Verona and enjoy all the amazing places this city has to offer you!